The Foundation for Accountability and Civic Trust (FACT) filed a complaint on Thursday against Sen. Bill Nelson (D., Fla.), saying the senator violated senate ethics rules by leaking potentially classified or false information for political purposes. 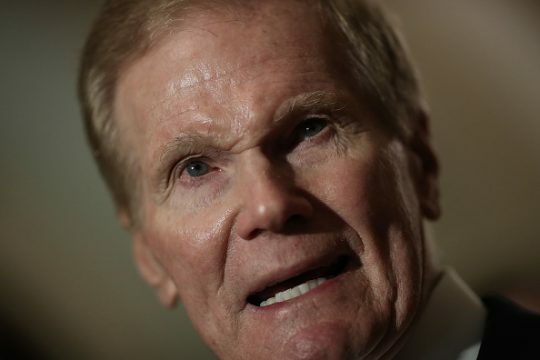 FACT sent the letter with their complaint to the Senate Select Committee on Ethics after Nelson publicly claimed Florida's election systems were currently compromised as a result of Russian meddling. "Nelson’s statements were not simply political remarks, but declarative statements about an issue extremely important to citizens and implicating the validity of our elections," FACT's letter said. "Nelson made these declarations with the authority and credibility of the Senate, which has access to classified information not made available to the public." When asked by the Tampa Bay Times' Steve Bousquet if Nelson meant Russia was meddling in Florida's systems in 2016 or "right now," Nelson responded "right now." Nelson's claim has been met with strong criticism, with the Washington Post's fact checkers giving it "Four Pinocchios" for being false. FACT said that whether Nelson's statements were simply false or based on classified information, they were dangerous and possibly illegal. "Yet, there is no publicly known evidence supporting the veracity of Nelson’s remarks. Consequently, it appears either Nelson’s claims are based upon, and discloses, classified information he obtained from his position as a Senator, or evidence does not exist and his statements were false," FACT's letter said. "In either instance, it appears that Nelson has violated Senate Rules and Regulations." FACT Executive Director Kendra Arnold said the statements from Nelson, who is up for re-election this year, amounted to improper "election meddling." "As a member of the Senate Intelligence Committee, Bill Nelson has a very serious responsibility in ensuring that classified information is handled appropriately so as to safeguard our nation. It’s clear from this case that he willfully neglected this responsibility," Arnold said. "We are asking the Senate Ethics Committee to investigate this very serious matter because leaking classified information and lying to incite fear in the public and advance one’s political career can never be tolerated. That in itself is election meddling." Nelson faces a heated challenge for his senate seat from Florida Gov. Rick Scott (R.). Most recent polls show Scott with an advantage over the Democratic senator. This entry was posted in National Security and tagged Bill Nelson, Ethics, Florida, Senate. Bookmark the permalink.